Digging through some old totes in our basement, I was delighted to run across one of my favorite pagan books. 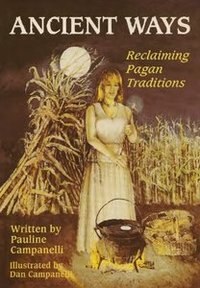 Ancient Ways: Reclaiming Pagan Traditions is chock-full of not only technical knowledge—from pagan lore to historic traditions—but also incredibly fulfilling activities, celebrations, recipes, and rituals to celebrate each season in turn. Written by Pauline Campanelli and illustrated by Dan Campanelli, the book is an absolute wonderful resource. It’s no wonder my old copy has so many dog-eared pages!